In the course (an entry level course in Emerging Information Technologies) that I am currently teaching at The College of Westchester, I have been using the WSQ method as part of an assignment once a week, and it’s been working out very well. 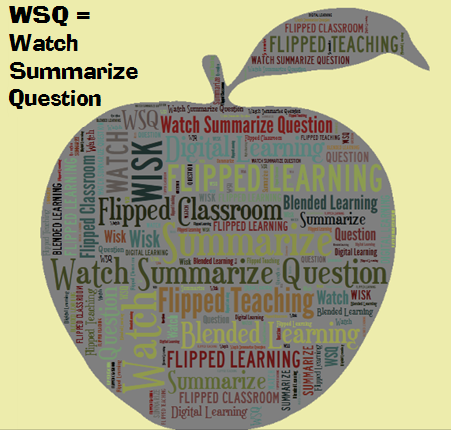 For those who aren’t familiar with the WSQ method, coined by Crystal Kirch, here’s the basic idea: assign a video to watch as homework and require the submission of a written summary which includes a question based on the material. It is an elegantly simple idea and it works. Of course, the content doesn’t have to be just one video – it could be more than one, or a mix of video and reading or other content consumption. I suggest avoiding long videos – I usually use one or two that total no more than 20 minutes. Sometimes I combine a short video and a web page or article. Click here to learn more about the WSQ technique. Students are doing their homework: The vast majority of students are completing the assignments, on time. While a similar technique could be used with reading assignments (i.e. require some sort of written feedback), often there is no requirement beyond reading, and you really don’t know if they did it or not. Students are engaging with learning content: It is not easy to ‘zone out’ while watching the video and still write a decent summary and question. You can usually tell whether or not a student really ‘got it’ by reading their summaries and the question they ask, or if they didn’t and they’re just trying to fake it. It supports a cycle of learning activities: When it comes to getting someone to understand something, I really like the construct, “tell them what you are going to tell them, tell them, then tell them what you told them”. When using the WSQ technique, I am always sure to introduce the topic in class (“tell them what you are going to tell them”), watching the video accomplishes the “tell them” step, and then in class when we review the material, that’s equivalent to “tell then what you told them”. We can then take it one step further by doing some sort of assignment in which they apply what they learned. Students come to class ready to take a deeper dive into the subject: Having been introduced to the topic by me, and then more thoroughly via the video or other content, students are primed to further explore the topic in the class. The written summaries also provide an opportunity to assess student understanding and dive right into any apparent issues. It provides opportunities for writing (and writing assessment): I little side benefit of this type of assignment is that students have to write frequently. As you review and critique what they wrote, you have an opportunity to address issues with grammar, spelling, etc., in addition to the points they are making. Are you using the WSQ technique already? What are your observation about it? If you aren’t using WSQ, go ahead and give it a try! Participate in Flipped Learning Day With These 3 Easy Steps! The Flipped Classroom is Everywhere! I teach music (piano) in a classroom setting, and use a similar technique in classes of 20-30 elementary-aged children. I have students watch a short demo video that I create, analyze a small portion of a simple music score (connecting to text), then apply. I’m currently creating a body of work and putting them on a developing website so that students can learn at home. . . . It has dramatically increased the learning pace in the 4 months I’ve applied this technique!